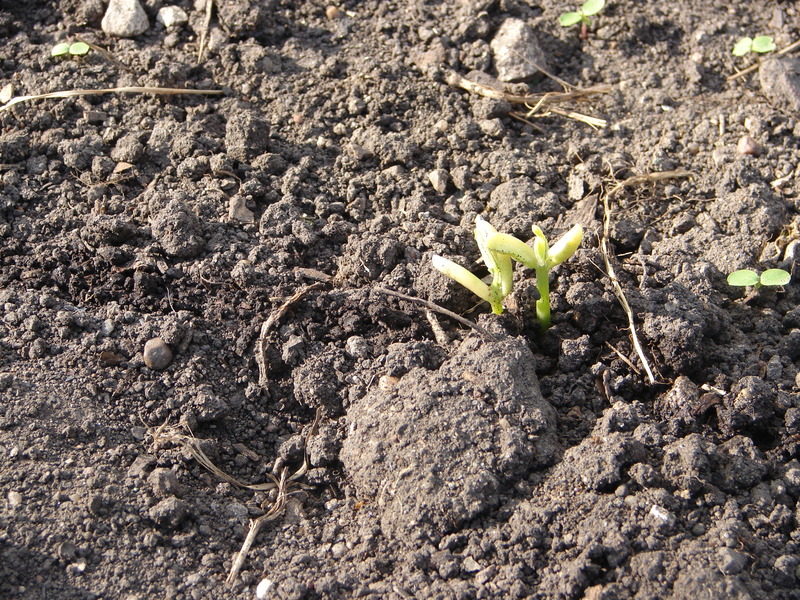 One week after planting–May 7th. It’s hard for me to say with much conviction which vegetable is the “best,” which vegetable I look forward to eating the most. I’m a huge tomato fan; for years I was the only one in my immediate family to eat them, usually one at every meal to keep up with the endless supply from my grandparents. Green beans are my comfort food. When I start to run low on Grandma’s canned green beans, I get a anxious, I plan trips back home around this–what if I have a bad day? Sweet corn makes a convincing argument for the top spot, though. Probably because everyone seems to like it, or at least everyone in my family. It’s kind of expensive to buy, too, so it’s good to have your own. Living off the land and all that. The photo on the left is at the beginning of July. Lovely. The photo on the right is at the end of July, right before I moved to Lawrence. I had to leave before it was ready, but I had to pick some. 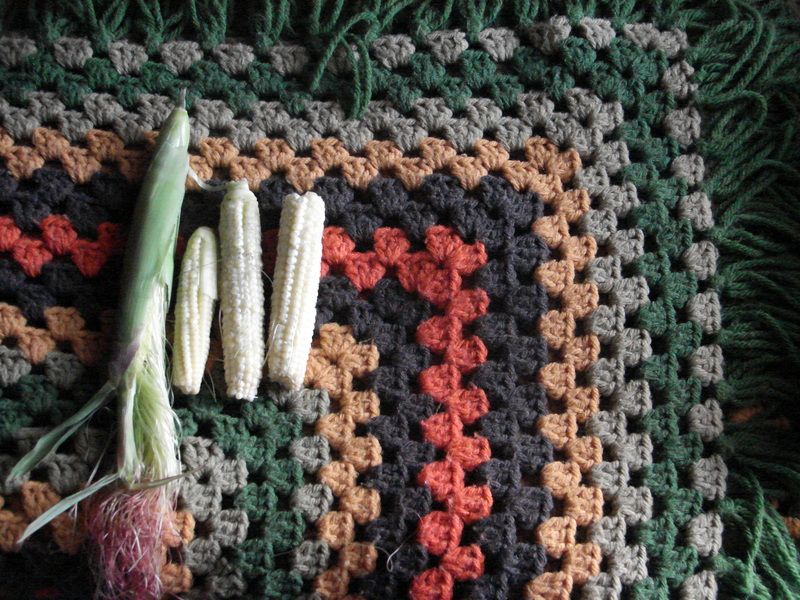 Then I spent 30 minutes marveling at how it just looked like “little corn” and asking my roommates if I could eat it. The verdict was “no,” but I did it anyway. It sort of tasted like corn. So you’ve gotta plant sweet corn, right? Right. One requirement for corn: space. Not necessarily Iowa-space, although that approach is effective. The reason space is necessary is because corn does something really cool: cross pollination. The name is self-explanatory, but just in case, here’s a definition: transferring pollen from the flowers of one plant of a species to the stigma of another plant of the same species. 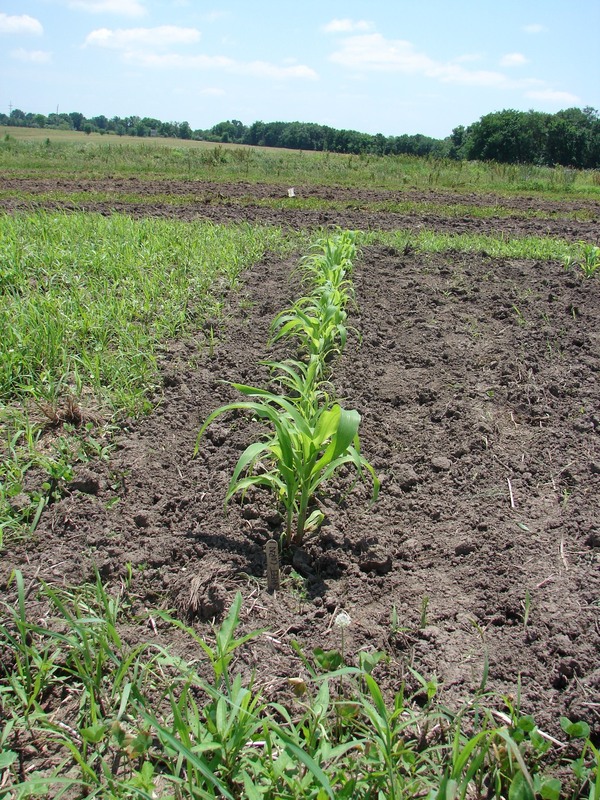 Growing corn successfully requires space, because you need to plant multiple rows so that it can do this cross pollination thing. This mostly happens with the wind. Last year was no problem. 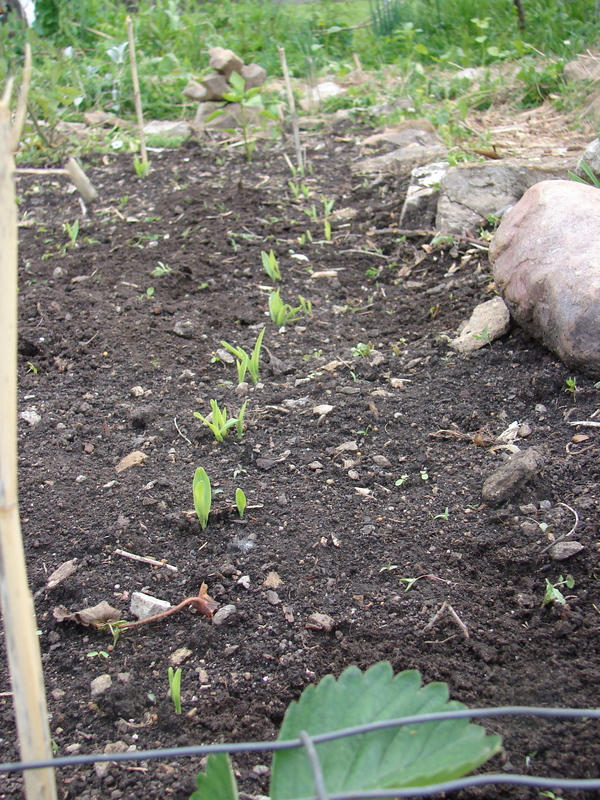 My plot was huge (the photo above shows only about 1/3 of the total space I had), so I planted a couple of rows of corn. Perfecto. Our garden plot this year is small and cute and most importantly, manageable. Its size, and the list of other things we’d already decided to plant in it, though, made it less than ideal for corn. After hearing the list of what we were planting, one of my teaching colleagues reminded me that corn needed space. I’m kind of stubborn. Resilient sounds better. Resilient like corn. All the other gardeners involved with the community garden like to know what everyone else is doing, planting, etc. Apparently word had gotten out that we were planting corn. One gardener informed Amelia that it wouldn’t work because we didn’t have enough space. When Amelia told me this, I got frustrated, but mostly nervous that this other gardener was right. We discussed whether or not to plant the corn. We were going to plant the corn in two tight rows, so theoretically, it should be able to cross pollinate. Luckily, Amelia didn’t mind this experiment. She’s patient enough to humor me in this attempt and adventurous enough to plant something that may or may not work. So into the ground the seeds went, 1 inch deep, 7-9 inches apart. “Good luck with that,” he laughed. He finished cutting some flowers and started to leave. Grandma Pat uses the phrase “making garden.” That seems like a good enough reason to me. We had one last thing to do before we could plant: enter transplanting. Our garden neighbor Danielle is an expert transplanter; unfortunately, she wasn’t in the garden that afternoon, so we were on our own. You can see a leafy green plant to the right of the photo. This is a flower of some sort (I forgot the name). There are also two strawberry plants in the middle of the plot, which are harder to see. Amelia moved the strawberry plants to the corner of the plot without much injury. I was supposed to move the bush thing to a flower garden in the plot next door. I totally destroyed it, though. Totally. It started out okay, and then I had to dig under rocks and tear off some of its leaves and then move rocks. I used a shovel and a hoe and then a shovel again. The roots split into a million pieces and dirt and snails fell everywhere. I am not an expert transplanter. We watered the transplanted strawberries, and threw the bush I had killed into a weed pile near the edge of the comm unity garden. On the docket: 2 rows of corn, 1 and 1/2 rows of green beans, 1/2 a row of shallots, 2 tomato plants, 1 pepper plant, some basil & thyme. Green beans and shallots were first. Here is a photo of Amelia planting the first vegetable of the year, a very important moment. Next came the corn. Then two tomato plants and one pepper plant. Last was the basil and thyme. Amelia is a good planner. I am a good planner, too, but most of it happens in my head. After I make a plan, I remember it. I also have poor spatial skills. I never remember this until I’m trying to find the right sized tupperware container for leftovers, or until someone asks me the size of something. Note that I’ve never told the size of my plot. If I have given any dimensions, they are probably terribly inaccurate. Planning things in my head with poor spatial skills works okay for me, but doesn’t always translate into something someone else can understand. It was Amelia’s idea to sketch our garden out. We met about a week before we wanted to plant. She brought a sketchpad. 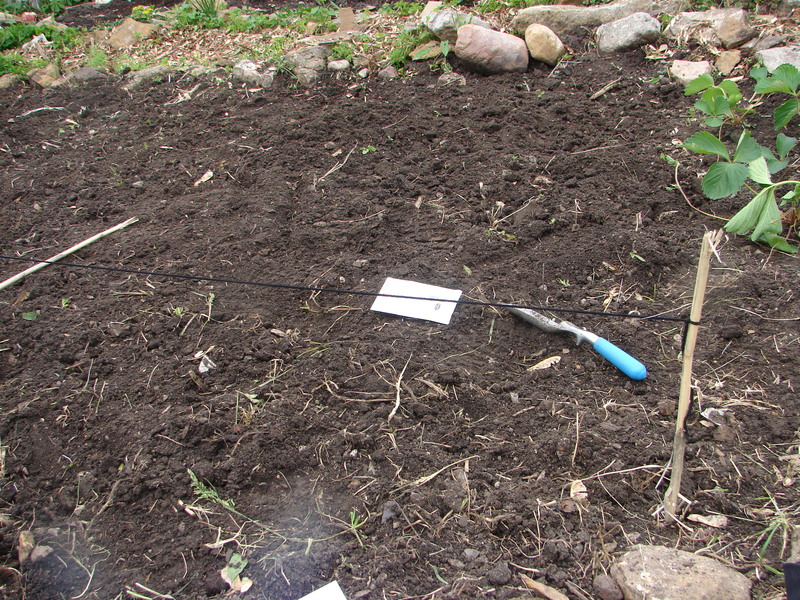 We drew out each section of the garden (herbs, flowers, vegetables) and where each different vegetable would go. Then we went shopping. There is a nursery in Lawrence that will give you a replacement plant if you kill the one you buy. Even if you kill it because you never water it. Even if you kill it because you are just bad at gardening. You take them the receipt, they give you a plant no questions asked. I tell my friends this every time we drive by the nursery. It is amazing. We bought a few flowers that day. 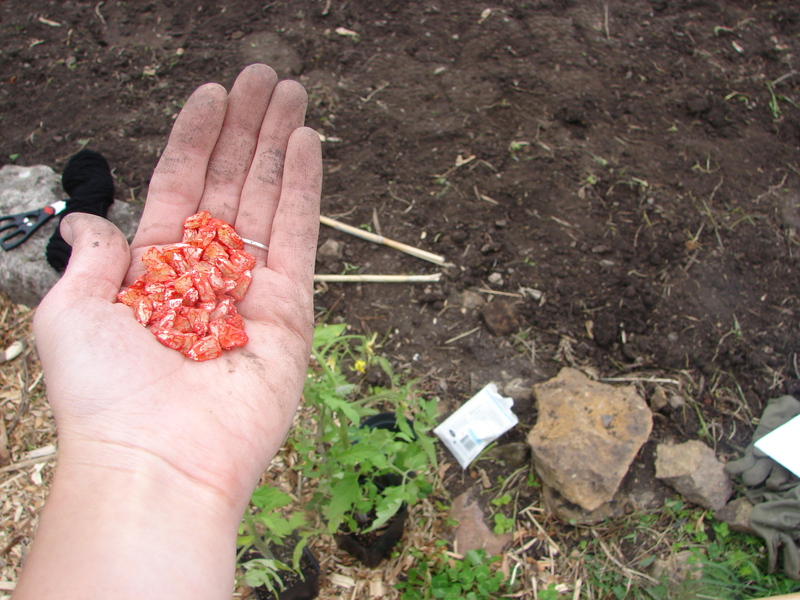 I picked up our seeds later, and Amelia bought tomato and pepper plants at Farmer’s Market. She also got some basil. 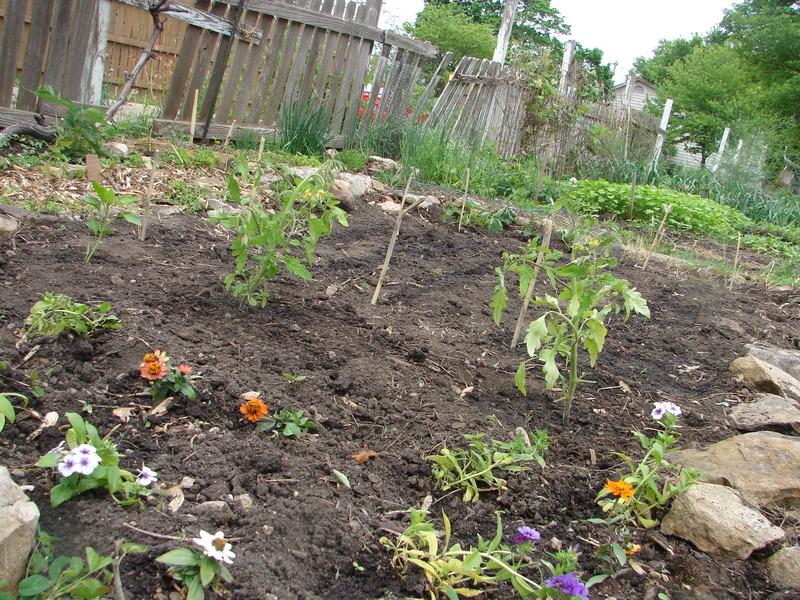 This was the finished product of our first Saturday cleaning up the plot. You can see the dirt. You can see the rock wall. You can see where we are supposed to plant the things we are going to plant. These are all good things. You can also see the crabgrass-strawberry-winter onion-take-over happening on the eastern end of our plot. Or maybe you can’t. Zoom in: The things that look like gigantic versions of the green onions that a lot of people grow in their gardens in Missouri (maybe in Kansas, too?) are winter onions. There’s probably a more scientific definition/description, but that’s what I’ve got for you. Apparently these are good for cooking, etc, but it’s so late in the year that they’re just bitter now. All I know is that their roots (ie the actual onions) are gigantic and impossible for me to remove. The times that I tried only resulted in my hands being covered in a wet, sticky onion juice. You know what crabgrass is. There is more of it (lots more) to the right of what you can see in the photo. Dads who are into their lawns complain a lot about crabgrass. I never thought crabgrass was a big deal, because it just looks like grass. The strawberries are the clover-looking plants with the white flowers. 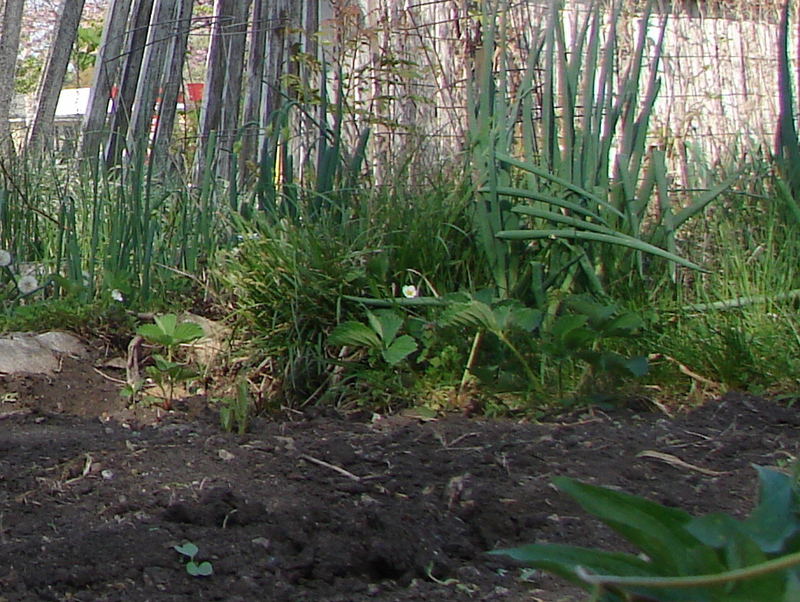 Strawberries are great, but nestled in between crabgrass and winter onions isn’t the best location for them. Amelia and I decided to leave this mess for later. It covered the area of about three square feet, and it wouldn’t move. There was no tiller. We were tired. We had a strategy: find a man friend, someone really manly. 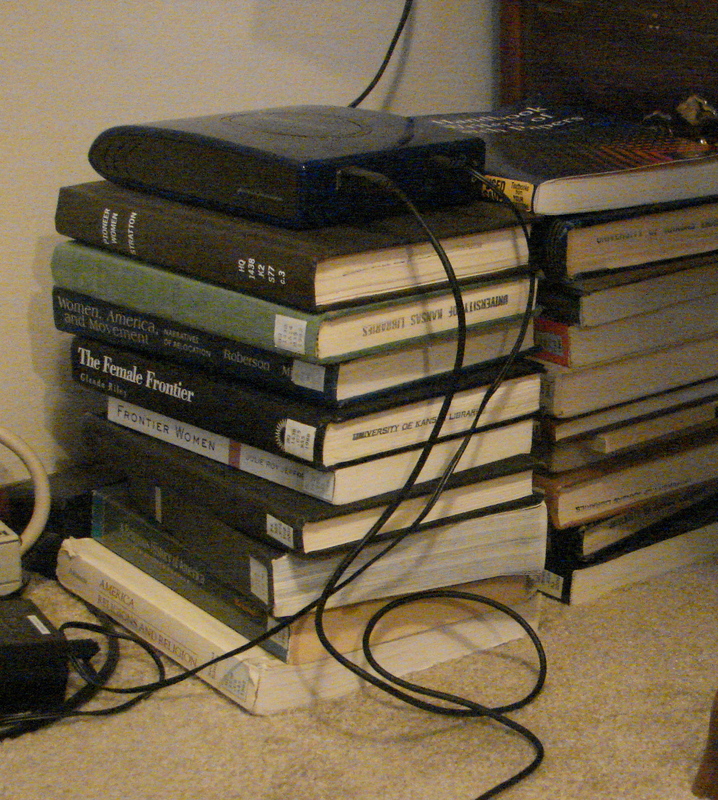 These are books about pioneer women and America’s Westward movement (the cords are probably just a fire hazard). More specifically, these are books about pioneer women and their personal writing in journals and diaries. Pioneer women are great. Really, they are. I spent a lot of time with these books this semester, a few hours a day almost every day. The week after our initial clean up day, I had the third or fourth or eighth or twelfth part of an epic semester-long project using these books due. Monday of that week: I got to campus at 9:30 and taught, worked, etc until 5. I ate a quick dinner while I checked my email, and worked on this project until I went to sleep at 12:30. Tuesday of that week: On my late afternoon walk home, I realized that my plans for the evening were identical to the night before. I was done with this project. Not technically done. Not done in the sense that I could stop working on it, but done. 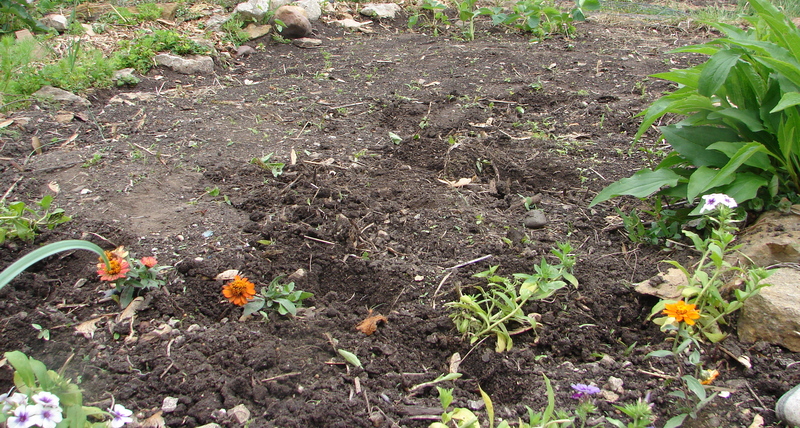 I was surprised when the crabgrass actually moved, more surprised when I could throw chunks of it out of the garden. Sometimes the garden hoe with the sharp triangle-shaped blade worked best. The crabgrass and its roots came out in small bits. Sometimes I stood on the top of a shovel, forcing my entire body weight into the ground, breaking through roots and dislodging larger sections. The breakthrough was when I got a set of winter onions completely uprooted. I went home and wrote until bedtime. My back was only a little sore, so I did the same thing Wednesday: a day on campus, 40 minutes with the weeds, then writing, bed. And Thursday. My body felt off balance from the work. I told a friend that I felt like I was walking crooked; she insisted that I wasn’t. On Friday, there was no crabgrass. There were no winter onions. Oh, I turned the paper in, too. It only took about 30 seconds for me to realize that I don’t have a definition. Community is complex. A lot more complex than we give it credit for. Working together is beautiful and we all want genuine community, but we’re not always that good at it. So, I guess that’s what this summer (and blog) is about–seeing yet another way that community can/should function and the complications that arise. a) The lot is split into two parts–the community plot and the individuals plots. I’m doing both, so I’ll try to make my posts about each one clear. b) I have no idea who owns the lot that I’m gardening on, and I didn’t realize this until someone asked me who owned the land. That’s kind of cool. c) Nothing can be planted in the community plot without us talking about it. Nothing. d) We make decisions together, but we have a “head gardener” (ie boss). This is probably a good thing. a) Have you ever watched me make a decision? Imagine watching me make ten decisions…that’s about how long it takes for 10-15 people to make a decision together. My strategy–remain quiet. b) I’m nervous about putting forth a fair share of work. I think school and teaching put me a little behind. Hopefully no one else is counting. a) There’s a guy who is really into green beans. This has been the only topic I felt passionate enough about to speak up. We planted a lot. b) Garden-wide emails seem to work pretty well for decision making. c) Chocolate mint…I didn’t know that existed. d) We work well together. We had a work day and got a lot accomplished. g) People know a lot more about gardening than I do. A lot. And building rain gutters and composting and killing slugs and…well…apparently a lot of things. Our plot is inside the rock wall you can see in the photo. I know, it doesn’t look like much of a garden plot at the moment. I’m not sure who had the plot last summer, so I don’t know who to blame for the crabgrass take-over. This is the western end of the plot. 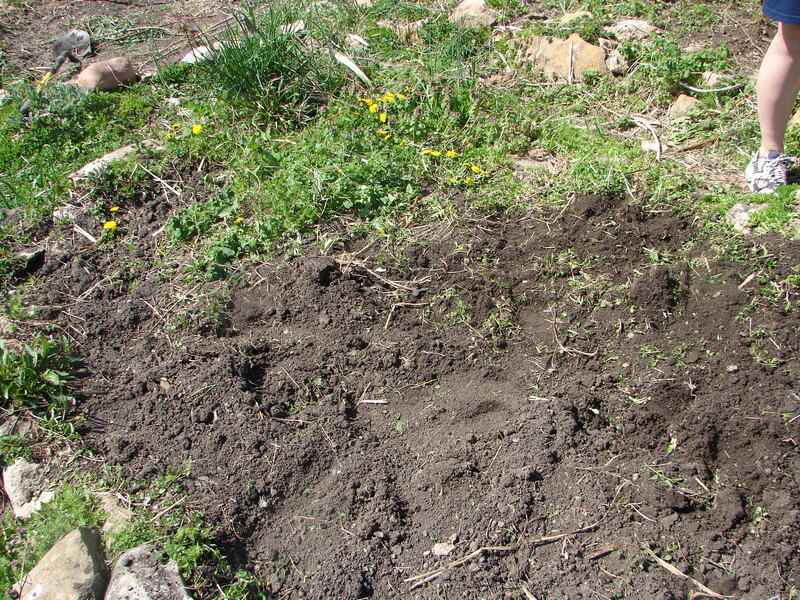 The eastern end is just as bad; in fact, the crabgrass seems to be rooted a little more strongly. 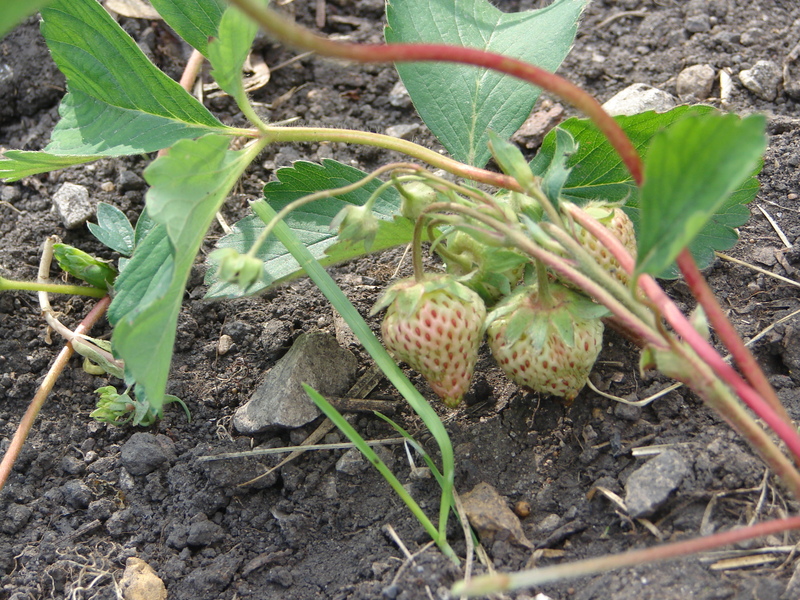 There are also strawberry plants on the eastern end to work around. Because the plot isn’t very big, we knew that we needed to get it as cleaned up as possible, so we could use all the space we had. Amelia, my “garden mate,” and I met up one Saturday to work on it. The woman who is working in the plot next to us, Danielle, was there as well. Danielle is cool. She knows a lot about plants. She also has a son who is four or five. He likes to pick up slugs. He marvels at how they are as long as his hand. Then he sticks them in your face. There’s not a whole lot to tell about this meeting. Lots of shoveling. Lots of hoeing. Lots of clumps of crabgrass. Lots of dirt. Lots of snails. Lots of “get-to-know-you” talk. A perfect way to spend a Saturday. The crowning moment of the day happened when I was unsuccessfully hoeing the weeds on the eastern end. “Is that an infant?” Amelia and Danielle were alarmed, and I remembered that to people who like children (or just to normal people) the thought of an infant lying in a garden might be problematic. They laughed. Someone said that it must have been some kind of decoration. 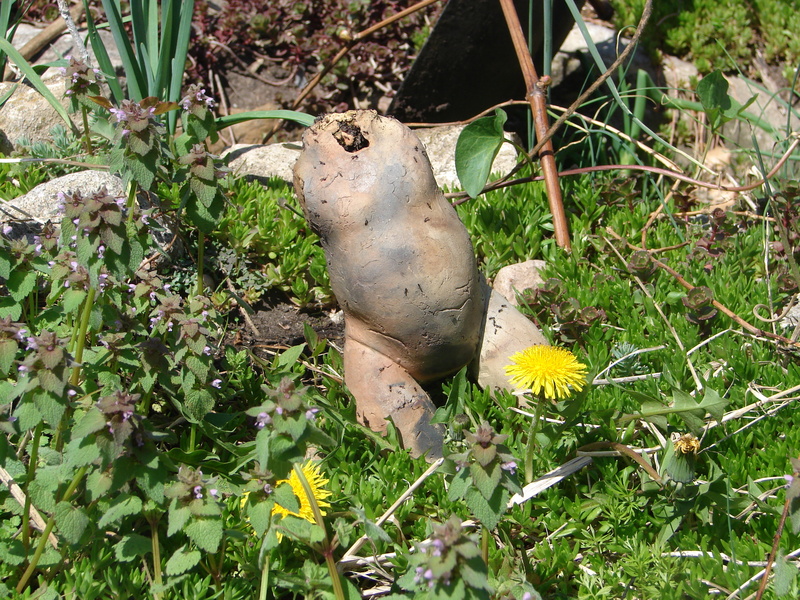 While we were discussing how odd it was to find a headless baby in the garden, I picked it up. Immediately, ants poured from where the infant’s head should have been. If you look closely at the photo, you can see them crawling on its torso. I screamed and threw it down. I am a little ashamed of this. I am not girl-y. You might remember Sid from Toy Story. Here is one of his toys. I see the resemblance. 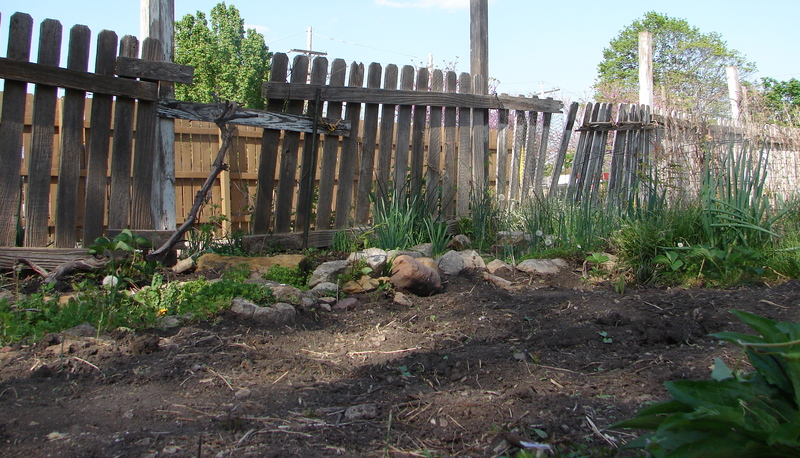 When I signed the lease for my apartment in Lawrence, KS last May, I ignored the fact that there was no place for a garden. I knew that I had to be okay with this, because apartment complexes do not have gardens. They have courtyards with worn out picnic tables and empty Miller Lite cans and spots where shrubs should be, but they do not have garden plots. I also ignored the fact that my apartment was next to the football stadium, but this is unrelated. I had been gardening for two years. The first garden was with Grandma Pat. 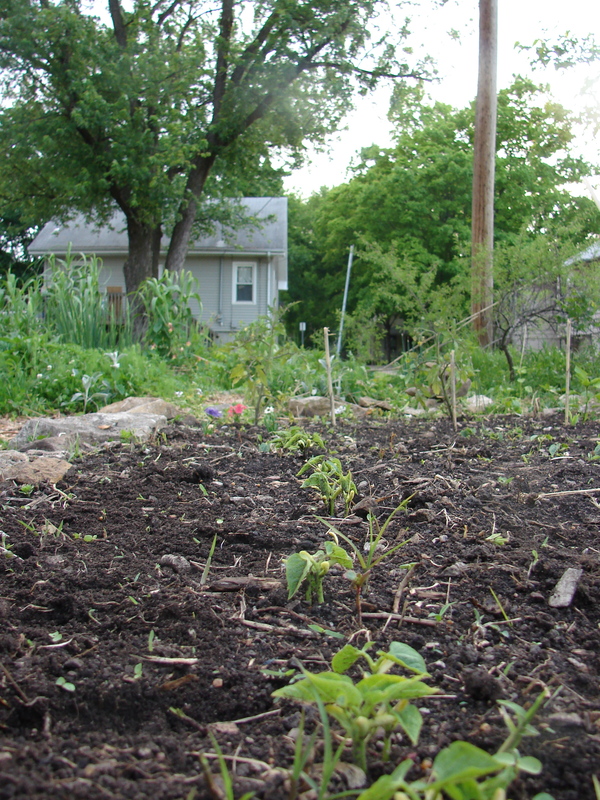 We planted the garden together, and then I lived in St. Louis for the summer, which meant that although we called the garden “mine,” she was its primary caretaker. The second time was in a field at Truman’s University Farm in Kirksville, MO. I had a lot of space. I planted my rows too far apart. There was no tiller. I spent a good deal of time hoeing in between the rows. I was convinced I could rid the plot of weeds. I was actually pretty successful in this endeavor. After two and a half months, I got enough Swiss chard for a few salads, one tomato, and approximately twelve green beans. I bought most of my vegetables at the Farmer’s Market that summer. I’m not sure that I’m actually a good gardener. 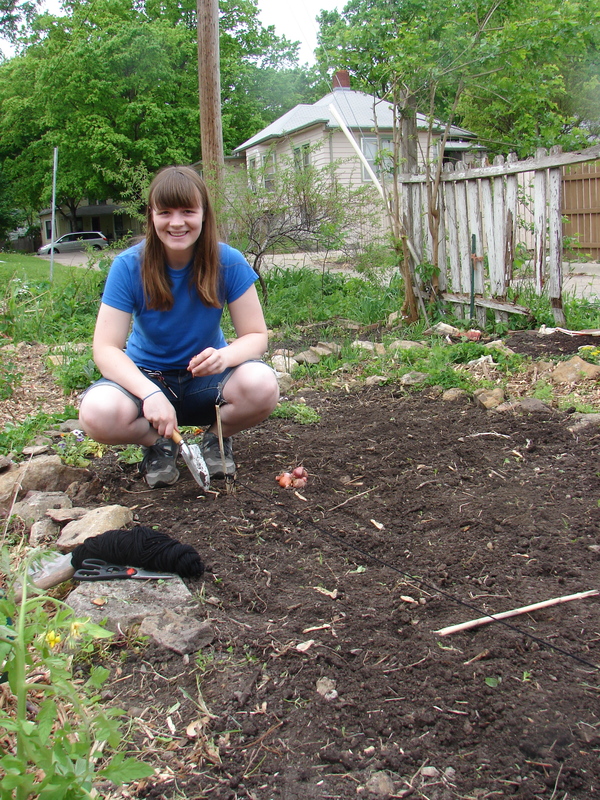 I resigned myself to the fact that I would not get to garden in Lawrence. I tried to be a big kid about this, because I was not, after all, moving to Kansas to garden, but to get my Master’s. These two things might be similar; I haven’t done enough of either to be sure yet. So, I guess I should say that I sort of resigned myself to the fact that I couldn’t garden, because as soon as I saw these two lots, I knew I would garden. I forgot about gardening during the school year, as I always do about things that other people have no trouble remembering–haircuts, birthday cards, changing my contacts, packing a lunch. It was icy or snowy or I was grading papers or writing my own essays or trying to convince a student that they probably wouldn’t fail or some combination of those. It was the beginning of April when I finally saw the sunflower seed package propped on my bookshelf. I thought I was too late. 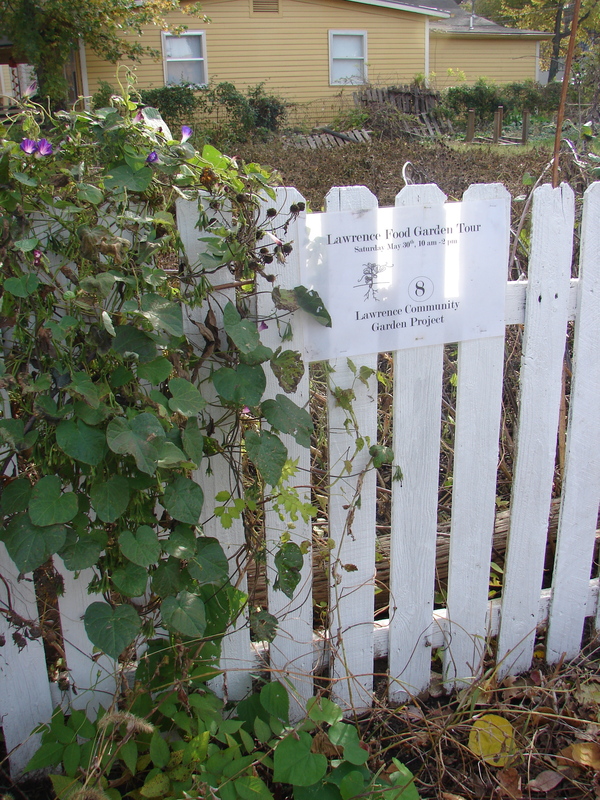 I googled the Lawrence Community Gardening Project, emailed the contact people from 2006, and accepted the fact that I would probably have to plant tomatoes in a five gallon bucket on my front stoop or buy one of those weird Topsy Turvy things (In case you’re curious: http://www.topsygardening.com/). I decided I would just not garden at all. Bucket gardens seem weird to me, and I am anti-Topsy Turvy. I got an email back: A plot had just opened up. There was another girl, did I want to share it with her? I could also help with the community part of the garden. Did I want to? Yes and yes. So, blogs can be (inherently are?) kind of cliché. So why am I even creating a blog? 1) The word “cliché” is cliché. There, I’ve said it. 2) When I first thought about blogging (it is a verb, right? ), I thought “No, I can’t have a blog. Everyone has a blog.” The mere fact that I’m even writing a justification for my blog shows how widespread they are. (It also shows that I just finished English 800 and have learned how to write a proposal for a book or dissertation sized topic. I must justify everything.) Blogs’ popularity is both a reason to have a blog and a reason not to. 3) I love gardening. And cooking. And I plan to spend a good portion of my summer doing these two things. I don’t intend to teach anyone anything about either of these two things with my blog, just to give updates. And since I’m in Kansas now and other people are other places, this is a good way to give updates. Thank you, internet. 4) The title is from a song Jeff Tweedy sings. “Watered Love” sounds a little lame, but trust me, it’s not. 5) I’m sure I’ll have a few important insights about life, too, so read closely.